I've be doing some search to gather Beta on doing MR in the winter but am finding limiting info. If someone can point me in the right direction, I would appreciate it. Main question - for a fast mountaineer, how long does it usually take. The info I've been getting ranges from anywhere between 2 - 5 days. FYI - I've done the MR route in the summer in 14 hours and have done snow ascents such as Baker in a day. Any/all other beta would be useful as well. Also, options for the last 500 feet; specifically the decent. Should I plan on building an anchor for a rope, use natural anchor, or plan on walking down? Before I get a ton of hate... I have done Baker several times. Have done emmons/winthrope on Rainier and disappointment cleaver on Rainer, and have taken various cravass rescues courses, one of which included hanging in a bottomless (at least it felt bottomless) for over a damn hour... I've done all this in the past 7 months or so, so I would still consider myself an advanced novice. But I probably spent a good 25 days above 10K feet on glaciers this past summer. I also have a lot of rock climbing experience (so I am very familiar with rope use and techniques). My last question is if early January is too early in the season to get plenty of snow? The way my schedule is looking right now, I may not have an opportunity later in the season, I'm hoping with the storms we just had, and maybe a little more snow later this month there should be decent snow conditions? Whitney in winter can be done... if the snow isn't so deep that you are swimming uphill in drifts. People go in January, but the conditions really make the difference. If it is a dry year, you can walk through the snow that isn't too deep. In a normal to heavy snow year, you'll be swimming and make maybe a mile in a day. That's when a group of strong mountaineers is needed so you can keep trading off the lead. I saw a recent mention of the mountaineers route, below the Ebersbacher Ledges having chest-deep snow. No surprise, as it drifts off the cliffs above and piles at the base, right where the MR route proceeds. Several guide services take people later on, when there's enough snow in the route to bury the brush (they skip the Ledges), and they can pack a path over the top. But the key is waiting for significant snow, and then waiting for it to consolidate so you can progress over the top of it. They use ropes to both climb and descend the Final 400. You won't find much beta on anything on Whitney now, since most people just stay away. I did it on 1-13-2014. It took about 12:40, car to car. The trip report is HERE. It can be done in a day. It's a lot easier and more fun to do on skis. Stash them at the top of the notch and boot up the final 400 (unless the coverage is good and you can ski it). Otherwise, slog it out on snowshoes. Sounds like you've done the requisite training and courses, which is great. 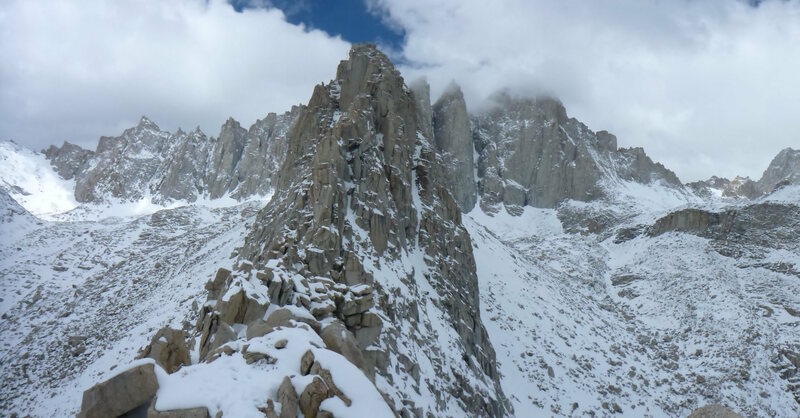 You won't find a crevasse or glacier on Whitney, but you may find avalanches. Have you taken an avy course? The Sierra snowpack is typically a lot more stable than WA, UT, CO, but they still happen. Be mindful of avalanches, especially in the lower north fork (lone pine creek) drainage. Im planning a winter ascent as well sometime in late march, are you going alone? it seems that you have the right knowledge and skills and even that there isn't any glaciers or crevasses I agree with the other people, Whitney has its own challenges I have done Mt Rainier and Baker among others in WA state, Im more a multi day guy I like to stay longer in the mountain, my approach is to go and assess as I go then make decisions according to the conditions such as time, energy, risk. Rope, 2 ice screws for the early ascent and 2 pickets for soft snow in the descent and of course the usual tools ice axe helmet etc. Good luck and hope you can accomplish your goal. Hey did you see that video on the daypack size gliding rig. It was amazing!! Some guy ran up a mountain with a relatively small day size pack. When he got to the top he rolled out the wing. Strapped it on and ran off the cliff and floated down to the base. Sure would be a great piece of equipment to use on Whitney. No idea if it would be legal or not. This is off-topic, but I'll bite: BASE jumpers do this. They do it in Yosemite, even though it is illegal -- they do it early in the morning so fewer people will see, and they can quickly hide/pack up their gear and walk out. I once talked to a guy who was on Half Dome early one morning who watched a guy do it. In reply to Steve’s off-topic convo…..I have to fess-up, my buddy and I jumped El Cap in October 1988. We both had 500-600 skydive each but had no previous base jumping experience. After the jump we nick named ourselves the “El Cap bozo load” as we slept up on the top of El Cap, froze our butts off, and then overslept when we did finally get some sleep! Consequently, we were rushed to get off the rock before it got too light and couldn’t find the proper exit point, duh. I went off first and immediately went into a front flip…NOT recommended on your first cliff dive ha ha. It probably took me a good 1000’ to stabilize face-to-earth so I could start tracking away from the cliff face. I opened way lower than I wanted and barely made it under canopy to the meadow, landing right by the north exit road, brushing the trees with my feet!! I then had to leg-it across the meadow to cross the river to stash my chute etc. under the riverbank. Of course, my buddy had a flawless jump and landed right next to me on the opposite side of the meadow by the Merced river. The final crux was seeing a ranger car inbound with lights flashing coming after us. Luckily for us, there was a VW Van parked about 100 yds away with some climbers hanging out drinking coffee who witnessed the whole debacle. We casually sauntered over and started talking to them right as the ranger slowed down, drove past with a very pissed look on his face and finally gunned it away into the distance, phew!!! El Cap, and to a lesser extent, Half Dome are siren calls for skydivers from all over the world. We just HAVE to come over to the US and jump it at least once!! Who would not want to jump such a beautiful 3000’ cliff face in such a gorgeous setting? Remember, this was before Youtube, Instagram and Facebook etc! In the 80’s there were only some old skydiving videos showing guys and gals jumping El Cap when it was initially legal…that’s what got me hooked from about 5000 miles away! Of course, as always, the few spoil it for the many…some idiots started taking skate boards and pogo sticks off there and ruined it for everyone when the NPS issued a blanket ban on base jumping in NP’s nationwide. I have to say, it was THE most thrilling experience of my life and I’ve been lucky enough to log almost 7000 skydives, climbed Mt. Rainier twice, have multiple summits of the CA 14’ers (incl. Whitney a number of times), run and mountain biked many endurance events, kayaked 450 miles of the Yukon river and raised two kids in the meantime! May the adventures continue……. Wow, PeteK!! Close call with the landing! Glad you survived, and I can understand it's being the top of your experiences list. In all the years I've monitored trip reports, I have never seen anyone write of crossing that ridge. It sure look impassable from either side -- lots of near vertical granite. You CAN go from lower Boy Scout over to Mirror Lk via Thor Peak, but it's a hefty climb in itself, and then you'd need to head back up the canyon to retrieve your gear. It has always been my experience that if you can climb something safely, that you can also descend it. It just takes more care. Guide services go up the MR that time of year, and they always rope up their clients and both climb and descend that way. If you go in April/May, you should find conditions good for crampons and an ice axe. However, if you encounter rock-hard ice that you can't get past, I would say turn around, don't even go up! See Pinnacle Pass, page 66 in Secor. It's in Google Books. Class 3, crosses just east of Pinnacle Pass needle. I've been up and down both sides, from Trail Camp and Upper Boy Scout. It's fairly mellow, but that was without gear or ice or snow. Your mileage may vary, be safe, standard disclaimers. Might be best to listen to Steve C.
Edit: Yeah, what bobpickering says below, too. I promise never to write a trip report again. To summarize/simplify what others have said, it is far easier to descend the MR than to descend the main trail and then find your way back to your tent at UBSL. Ok, I'm going to descend down the MR. You guys rock with all the info. Much appreciated. I’ve done it before Steve. It’s definitely not going to be easy to cross that ridge to get back to the North Fork. Far better to descend the MR.
Another off topic question - Is there a more direct route from Clyde Meadows to Iceberg Lake? Possibly going up the cliffs above Clyde Meadows rather than "traverse" around to a spot under Iceberg Lake. I pulled up CalTopo and was surprised to see a trail going through the cliffs as you describe. I’ve never seen anyone go that way, though I’m sure that there is a way though the cliffs. There is a use trail that goes toward UBSL and then heads ~SW and then W to a point just N of the moraine. From there it goes N or NW to decent camping S of Iceberg Lake. The easiest way to the MR is to follow this use trail. That photo is stunning. I feel like I am looking through a Whitney stereoscope. Well done, and I mean the climb. Generated in 0.106 seconds in which 0.094 seconds were spent on a total of 14 queries. Zlib compression disabled.